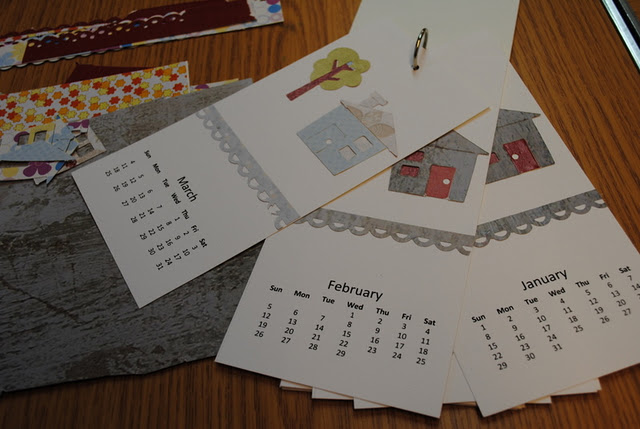 Hello, everyone :) Thanks for your kind comments about the calendars I made with my papercrafts class! I initially created each page to be A5, but then realised I didn't have enough cardstock to print them that size! That file is here though. I then rejigged them a bit to fit 3 months onto a sheet of A4; that file is here (I seem to recall that it has a blank page at the end that I couldn't get rid of, just ignore that!) You need to trim it down to just under 10cm (9.9cm-ish) after printing. The example above is at that size. And there's a single A4 page with 3 copies of the front cover (which just simply says '2012' on it). If you'd like that too it's here but it would be easy enough to create a cover at the right size if you want one, or not to bother at all as you'll only have the months on display, after all! We punched holes at the top for hanging. You can punch a single hole and pop them straight onto a hook or nail, or you can punch two holes and thread ribbon through to make a hanging loop. Alternatively, if the cardstock is sturdy enough you can put the pages onto book rings and stand the whole thing up on a shelf or desk. I hope you find it useful, and have some fun decorating them with stamps or photos or paper scraps :) If you do I'd love to see the result, so please do let me know. Great idea for calendars,Mel....and thank you so much for your xmas card. Thanks for the links and thanks for the Christmas card! These are wonderful! 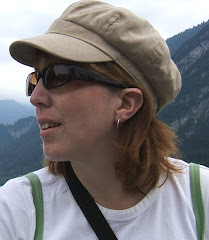 I seem to be falling behind in my blog reading pretty consistently, but have enjoyed catching up with you today.